The Howard triplets look like members of a wrestling club for 6-month-olds. 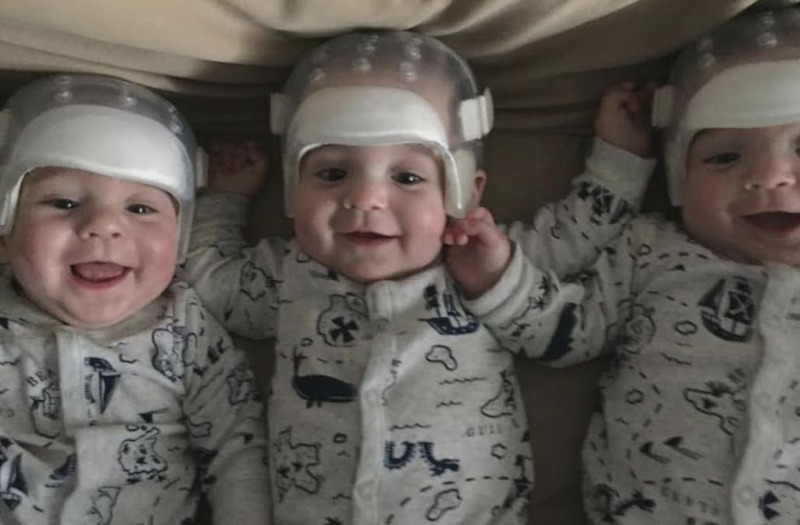 On their little heads are clear plastic helmets designed to protect their precious noggins while recuperating from skull surgery to correct a rare disorder. They were born with craniosynostosis, a birth defect that causes a baby's skull to prematurely fuse while its brain is still growing. A misshapen head results, which can destroy vision and mental development. So when surgeons at New York's Stony Brook University Hospital came up with a strategy in January to remove tiny pieces of bone around the babies' soft spots – thereby allowing their heads to grow and expand normally – Amy and Mike Howard said yes. The easy part was agreeing the procedures would change their children's lives for the better. The hard part was enduring the procedures, the parents told InsideEdition.com. "Those were the worst two days of my life," said Amy. Hunter and Jackson, who are identical, had the same form of the defect and went under the knife first. Kaden, who is a fraternal sibling, went into surgery the next day. "They were taking my babies, which I was getting used to having, and then they're putting them under," said their mother. "It was rough." But the endoscopic surgeries were minimally invasive and went off without a hitch, the parents said. "The staff, the doctors, were just so amazing," said Mike. "The anesthesiologist was texting us the whole time." At first, the boys didn't seem too pleased with the new helmets on their heads. They fussed at them for a while, then gave up the fight, their parents said. They wear them almost all the time. "They don't even cry when I put them on at night," Amy said. The helmets are designed to protect the surgery sites, as well as to prevent the infants' malleable skulls from returning to their irregular shapes. Amy's goal is for the boys to be helmet-free by their first birthday. The mom and dad said they were shocked to learn Amy was carrying triplets. Besides an aunt of Mike's who had twins, multiple births did not run in their families. And they weren't undergoing fertility treatments, either. "I think it was just pure luck," Mike said. Asked if they were going to have more, Amy replied right away. "We're done," she said. Her husband just laughed. He had suggested they might try again, hoping for a girl. Amy wasn't having it. "He didn't have to walk around for 35 weeks carrying these three," she said. "We're absolutely blessed," he said.